Many homeowners understand the importance of doing household maintenance to prevent costly repairs later on, and many have a plan which they implement to keep things running smoothly. A lot of things can be taken care of by the homeowners themselves, but there are some large, heavy and complicated devices that require the assistance of professionals. This is the case when it comes to your garage door. Many homeowners use their garage door and opener every day, and this can lead to a lot of wear and tear, which will cause their interior and exterior to break down prematurely and unexpectedly, putting you and your family at risk. The objective of regular service appointments is to increase the longevity of your system and to make sure that the door remains safe and secure. We'll examine the condition of all of its different components, as well as the functionality of all of its various features. Our expert technicians will carry out a range of preventive maintenance tasks that will make sure your system stays in a great working condition. During such a routine checkup, our technician will lubricate and adjust your springs as required to ensure their smooth operation. They'll also apply lubrication to other moving parts, such as the rollers, to prevent rust and corrosion from developing. During the visit, our technician will also perform a safety sensor test as well, which will make sure your door is safe to use. If any problems are discovered, we will repair them on the spot. 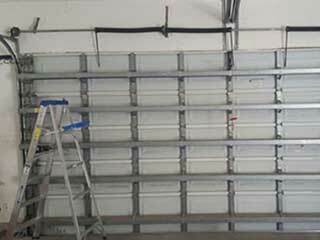 Keeping your overhead door system in good shape will ensure a longer lifespan and will also save you a lot of money on preventable malfunctions. So, what are you waiting for? Call our experts at Garage Door Repair Brooklyn to schedule an appointment today!